As we all know, one of the most useful aspects of the Internet is that it provides an abundant amount of options to search, view and purchase products and services of all kinds in just a few keystrokes. Sometimes the choices almost seem unlimited, and for all intents and purposes, making a decision can be a daunting exercise. Which is best? Who offers the best price? Can I trust the vendor? How soon will my product be shipped? When will it arrive? There is no doubt that the questions can be endless, which is why in this post, we’re taking a close look at how to choose the best online printer. To begin, most online printers provide printing services at more reasonable prices than your local brick and mortar print shop. It’s likely that the offerings may range somewhat from website to website, however the best companies usually offer a wide array of options from which to choose to print business cards, flyers, postcards, banners, brochures, promotional tools and more. Many online printers also provide design assistance, including individualized customization and online design tools such as pre-designed templates. Variety, Quality & Experience – Who offers a large selection of quality products from which to choose? 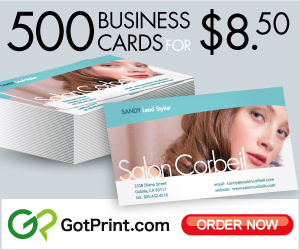 Seek out a printing company that allows you to the ability to print business cards, flyers, menus, banners, brochures and other paper products in various paper stocks, as well as non-paper items such as t-shirts, mugs, etc. Experience is also paramount. How long has this printer been in business? Are you able to see online samples of their work? Read the customer reviews. Design Tools – Does the printer offer online design tools? Whether they are creative editing tools for do-it-yourselfers, or the ability to work with a graphic designer one-on-one, this is a key area to consider. The best online printers provide downloadable templates to direct your design, as well as a whole host of pre-designed ones that you can use too. Many online printers will offer templates that are compatible with InDesign, Photoshop and other file types. Online Proofing – What happens after the design is complete and you uploaded your files? Will you have the opportunity to see an online proof before the actual printing occurs? This is of the utmost importance, as it will give you the opportunity to review all of your uploaded files, and catch any errors that may have been made during the design/file creation process. Customer Service – Even though printing your materials online should be easy and seamless, sometimes you’ll need support. Perhaps the files won’t open properly, or you’ve followed the template guidelines, yet the layout looks askew. Or maybe you need a custom quote. Online print services should offer several solutions, including personalized help on the telephone, through e-mail, or live chat, which is a good method to get in touch with customer service quickly. Shipping – This is always a big concern with ordering anything via the Internet. It is no different when choosing an online printer. Getting your materials when you need them is typically one of the most important factors to consider. The good news is that a reputable online printer will provide numerous shipping options, turnaround times and methods of return. Review their guidelines carefully. Many also offer integrated direct mailing services to help get your customer mailings completed quickly and at a reasonable price. Price – One of the biggest advantages to using online printing services is cost. Most online print companies don’t have an actual retail location, so their overall expenses are much less than that of your local print shop, enabling them to provide the same or even more services for a lesser cost. Plus, it takes a lot less of your valuable time to order online, than to visit a printer in person, especially if you’re processing repeat orders. When you compare online print prices by vendor, you will find some variation, so be sure to choose the best price, as long as you have also considered all of the previous tips noted above. Rob S. has more than 20 years experience as a content marketer and creative director. He has worked in a wide range of industries and enjoys creating content for various areas in the digital world: from social media, to online ads to website copy. Rob enjoys art, music, taking photos, managing his fantasy baseball team, staying fit, and of course, spending quality time with loved ones. My sister is making her own wedding invitations! I saw them and they look great. She told me that she doesn’t know where to print them, so I’m happy that I came across this article! I’ll let her know that she should look for an online printer that will offer templates compatible with Photoshop, which is what she is using. I think that finding a printing service is the right way to go. I love that tip about proofing the work before it is actually printed. Catching the mistakes could be invaluable! And, it could save you a ton of time and money. My brother and I have been wanting to do something special for our family reunion. I liked that you had mentioned that when it comes to looking for a print shop that it can be important to look for quality to make sure it’s all done correctly. We’ll have to start looking around for a print shop that can make something for us, and we’ll be making sure that we get something of quality. I like how you say that you would want to consider what kind of experience a printing service has. It would be good to consider this because it would ensure that they are qualified. My brother is looking for a printing service, so he’ll have to find someone with experience. Choosing the right printer is very difficult because printers have various brands and models. It is very useful for you to describe it in detail over here. In addition, before purchasing a printer you can also check different company printer reviews; if you can check reviews then you can easily decide what is right for you. I’m glad I came across your article about choosing the best digital printing service for my needs. I like how you talked about checking if a company has online proofing. I would never want to be in a situation where I submitted my designs for printing and then finding out later that there are formatting errors. Also, I agree with looking for one where I can work with a designer one-on-one. This way I can communicate my intended design better directly to the one who will be doing the printing. I will surely remember your tips and use it while I look for a professional who can help me out with my needs. Thanks for the tips for choosing a printing company. I have a high output of papers and blueprints that I need to print on a weekly basis, so I am trying to find the right company to handle it. I like that you mentioned to find a company that has a lot of experience. If they have been in business for a while, you can trust that they are reputable and successful. I will make sure to ask how long companies have been in business as I choose. It would be a really good idea to see online samples of someone’s work, that way you’d be able to get a sense of their style and quality. I want to print off some old letters of my grandparents in a book for the whole family. Finding someone who would have the quality I need would really help make this special. With my sister’s wedding coming up, we are trying to find a place to print off her invitations. It’s good to know that one thing we need to look into a company that allows us to do so in the paper stock of our choice. That way they will look and feel the way she would like them to, and she will be happy with them. Experience definitely is one thing to go with. Price is also very important. Thanks for your suggestion to look at whether or not a printing service offers online design tools to help you figure out your logo’s and designs. I imagine that this would be really helpful, especially for someone who hasn’t undertaken similar projects before. it would also make sense to me to use a shop that you know has good recommendations from past customers. Experience does seem like a good thing to go with. After all, you don’t want a large order to be messed up. It might be a good thing to go with someone who has a lot of positive reviews fro their printing services. Variety would be the most important thing for me when choosing a printer. I have a tendency to be unable to make up my mind or come up with new ideas that I want to try. Having the versatility in a printer to know that they will keep up with my demands would be a good reason to hire them. I liked that you mentioned looking for a printing company that offers online proofing. More specifically, you talk about how your ideas may not always translate the way you want them to when they are uploaded into a print company’s system. I think it’s a good idea to choose a print company that can offer you a free sample of your finished product. Your suggestion to find a printer that allows you to proof your design before having it printed. Like you mentioned, if you can proof the design first, that will give you the opportunity to catch any mistakes and make sure it looks good. It would also be helpful if they allowed you to view your proof on the material it will be printed on so you know it will look right.